34-year-old Nicolas Jackson was reportedly shot and killed at a Fort Worth nightclub Sunday morning, May 8, 2016. 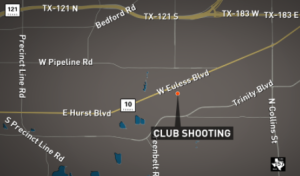 According to The Star-Telegram, the shooting “occurred in the 11000 block of South Pipeline Road, at an adult entertainment club.” Initial media reports indicate gunfire erupted at the nightclub around 3:40am, striking Mr. Jackson in the neck and chest. Nightclub patrons have a right to be safe and secure while on the premises of the establishment that they are visiting. The Murray Law Firm questions the level of security provided to patrons of the subject nightclub and whether this tragedy may have been prevented. What nightclub security measures, such as weapons screenings, surveillance cameras, bright lighting, and security patrols, were in place to protect patrons at the time of the shooting? Generally, nightclub owners are required to protect all patrons legally on the premises from any foreseeable harm. Should the facts of this matter reveal that the owner or management of the establishment failed to provide adequate security to protect those on its premises, the family of Nicolas Jackson may elect to seek justice and pursue a legal claim for his wrongful death.